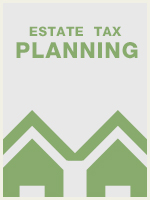 Estate Tax Planning examines the various aspects of planning for the estate tax liability. The course begins with a discussion of the genesis of estate taxation in English common law and continues with an examination of the estate and its administration. The subjects discussed in the course are a) the estate and its administration, b) federal gift and estate taxes, c) common estate planning trusts, d) calculating federal estate taxes, e) state inheritance and estate taxation, and f) estate tax payment. The text serves as an introduction to the issues of estate settlement and includes a discussion of the probate estate and the federal gross estate. The steps taken to calculate federal estate tax liability are discussed. In that discussion, the federal gross estate, tentative taxable estate, taxable estate and tentative tax are examined. The various estate tax credits and deductions are considered and their place in the federal estate tax calculation is explained. The role of trusts in estate tax minimization is considered. The common trusts employed in estate tax planning are explained, and the uses of credit shelter trusts, QTIP trusts and irrevocable life insurance trusts are demonstrated. State death taxes are considered, and inheritance taxes are compared to estate taxes with respect to the party liable for payment and the role of decedent/beneficiary relationships in inheritance taxation. Finally, the traditional sources of estate tax payment are examined and compared.